O all-glorious Argyre, you were just joined in marriage, as the pride of Prousa and the boast of Byzantium, when the prideful serpent, through the terrible tyrant tried to convince you to soil the virginity of your marriage. But you conquered him, ascending to the heavens with glory, where you now entreat the Risen God, to preserve the multitudes of the Orthodox in peace, and for us who in faith honor your grace-flowing body, grant forgiveness and great mercy. You put to shame tyrants through enduring tortures, O pure one, you were shown forth, O much-suffering one, as strong as a diamond, o glorious martyr of Christ, you showed forth in struggles for Christ the Savior, love and zeal and unquenchable longing, Who worthily glorified you, O Argyre. As an all-bright moon, you have shown upon the world, illumining with your pains like precious stones, O Argyre, and healing illnesses for those who cry out: Rejoice, the pride and boast of the Martyrs. Let us in faith gather for this most sacred and divine festival, which shines greater than silver and gold, of the all-honored Champion, Argyre the New Martyr, all the faithful who love the Martyrs, celebrating your all-radiant and glorious feast, harmoniously praising your super-human struggles, your deeds and pains, which you endured to preserve your marriage in virginity spotlessly, and the true faith of the Heavenly King, Christ God, entreating that we be granted, through your sacred and fervent intercessions to Him, [to partake] of that heavenly blessedness, in which the choirs joyously cry out: Rejoice, the pride and boast of the Martyrs. 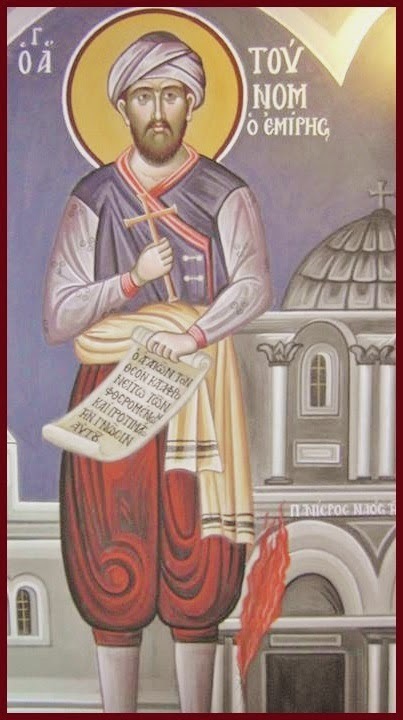 On this day (April 5th or 30th), the memory of the holy, glorious New Martyr Argyre. Shines upon us greater than silver*. *Note: "Argyre" in Greek means silver. 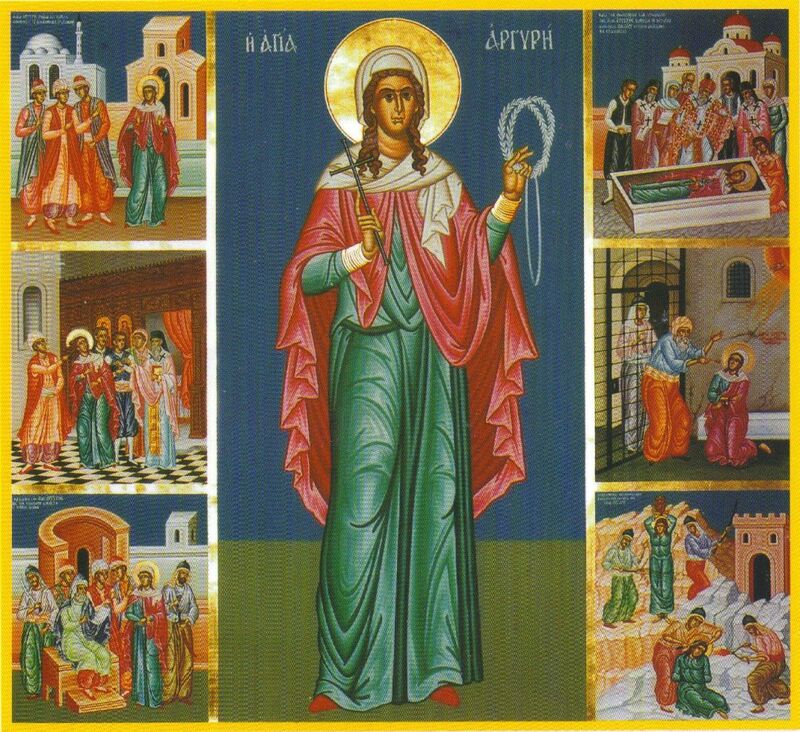 Come, all you who love the Martyrs, let us gather to praise the virgin martyr Argyre, for today she receives from Him the Crown of Struggles, having struggled lawfully. She rent asunder the prideful serpent, with the power of the Cross. 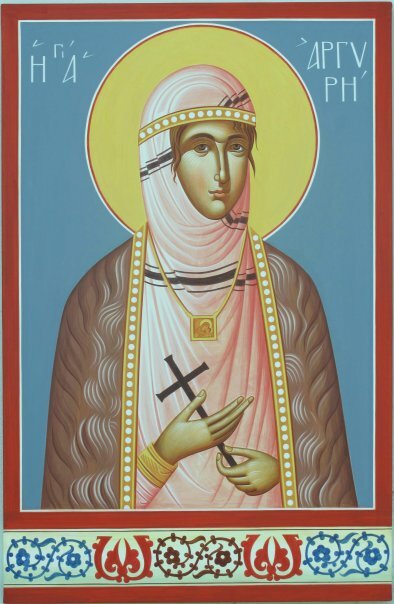 She bore the Orthodox faith in her steadfast mind, and shines greater than the sun. Therefore, rejoice together, O ranks of Angels and bands of Martyrs, together with those upon the earth, and celebrate and glorify her, whose greatly-struggled body was granted to the earth as a healing place of passions of the soul, and dangerous trials. As a radiant star, the much-suffering Martyr of Christ has dawned from Bithynia, enlightening all the multitudes of the faithful; let us magnify the glorious Argyre. 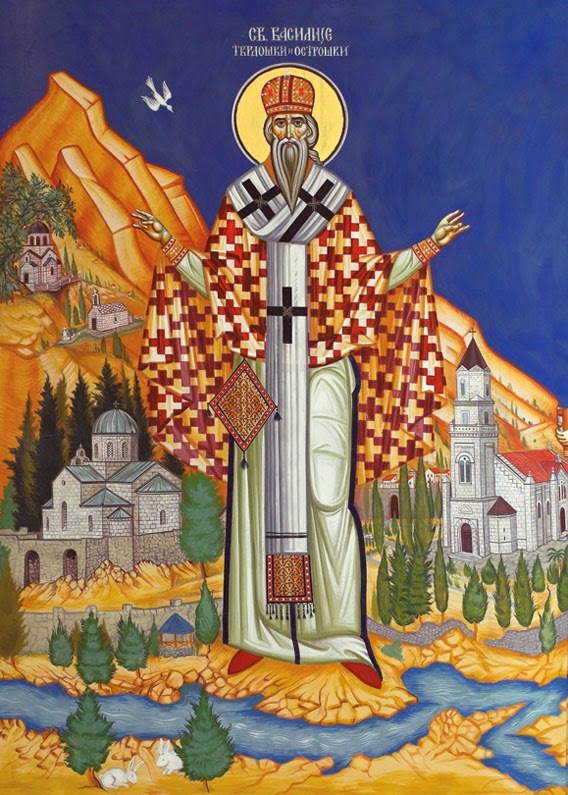 Saint Basil was born in Popovo Polje, a village in Hercegovina, of simple and God-fearing parents. From his youth he was filled with love for the Church of God and when he reached maturity he entered the monastery of the Dormition of the Most Holy Theotokos in Trebinje and there received the monastic tonsure. As a monk he quickly became renowned because of his genuine and infrequently-found ascetic life. Saint Basil took upon himself mortification upon mortification, each one heavier and more difficult than the last. 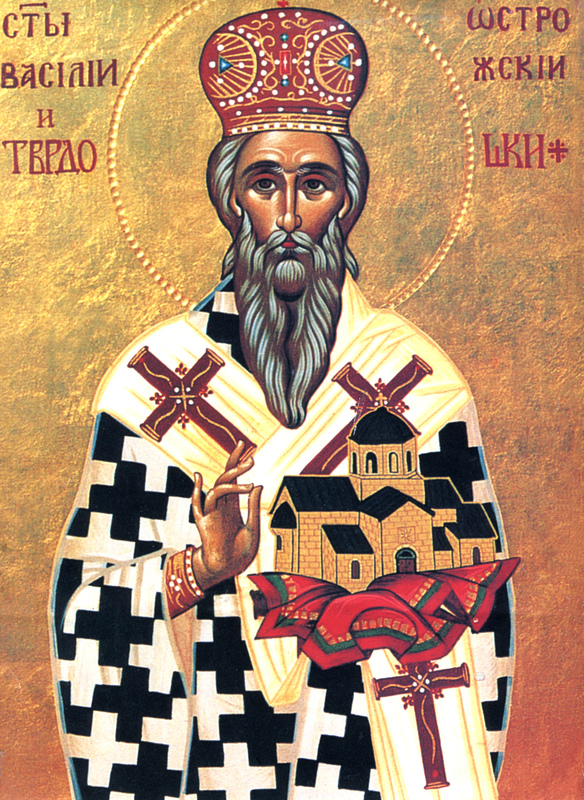 Later, against his will he was elected and consecrated as bishop of Zahumlje and Skenderija. 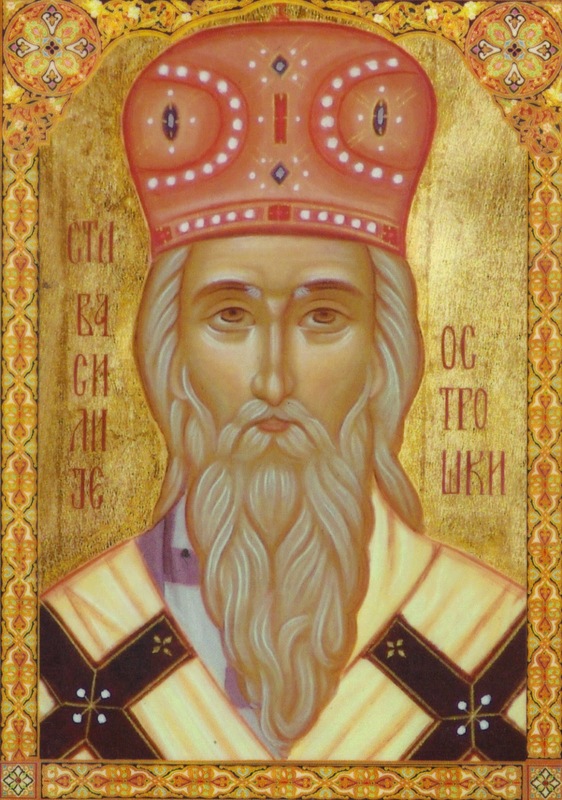 As a hierarch he first lived in the monastery of Tvrdosh and from there, as a good shepherd, he strengthened his flock in the Orthodox Faith, protecting them from the cruelty of the Turks and the cunning ways of Latins. 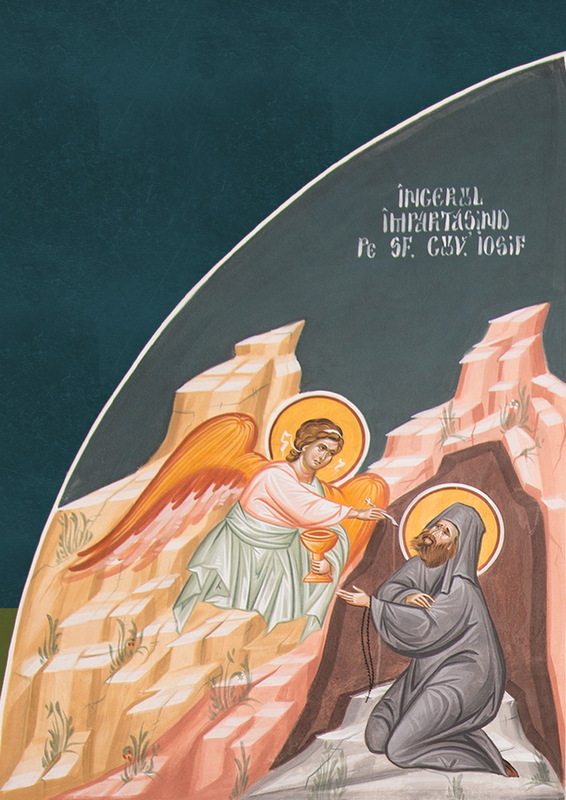 When Basil was exceedingly pressed by his enemies and Tvrdosh destroyed by the Turks*, he moved to Ostrog, where he lived an austere ascetic life, protecting his flock by his ceaseless and fervent prayer. 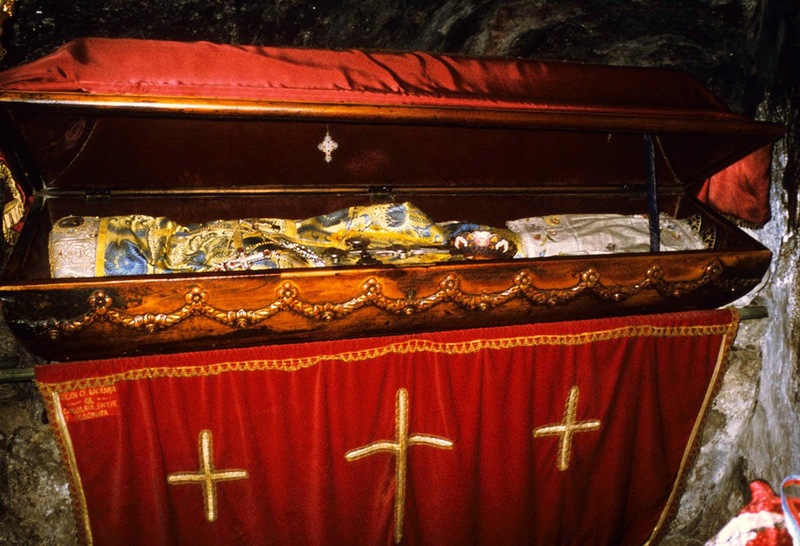 He fell asleep peacefully in Lord in the sixteenth century, leaving behind his incorrupt Relics, incorrupt and miracle-working to the present day. The miracles at the grave of Saint Basil are without number. Christians and Muslims alike come before his Relics and find healing for their gravest illnesses and afflictions. A great people’s assembly (sabor) occurs there annually on the Feast of Pentecost. *A new church was built in our day upon the ruins of the Old Tvrdosh monastery by Nikola Runjevac from the village of Poljica near Trebinje – a wonderful and glorious monumental church (zaduzbina) before God and before his people. Immediately after the falling asleep of St.Basil in 1671. people started coming in great numbers to pray at his grave, just as they were accustomed to doing during his earthly life. Many miracles began taking place at the site of his grave and they have not ceased to this day. Seven years after giving up his soul to God, in 1678., St.Basil appeared in a dream to father Rafailo (Kosijerevac) the Abbot of the St.Luke Monastery in Zhupa near Nikshich, and ordered him to go to Ostrog and open up the saint’s grave. The Abbot paid no attention to the dream and did not go. He had the same dream again but he again ignored it. St. Basil then appeared to the Abbot a third time, dressed in a bishop’s vestments, with a censer in his hand. The Abbot woke up in fear and trepidation and told the brotherhood of his monastery about his dream. They agreed at once to make a hasty journey to Ostrog. 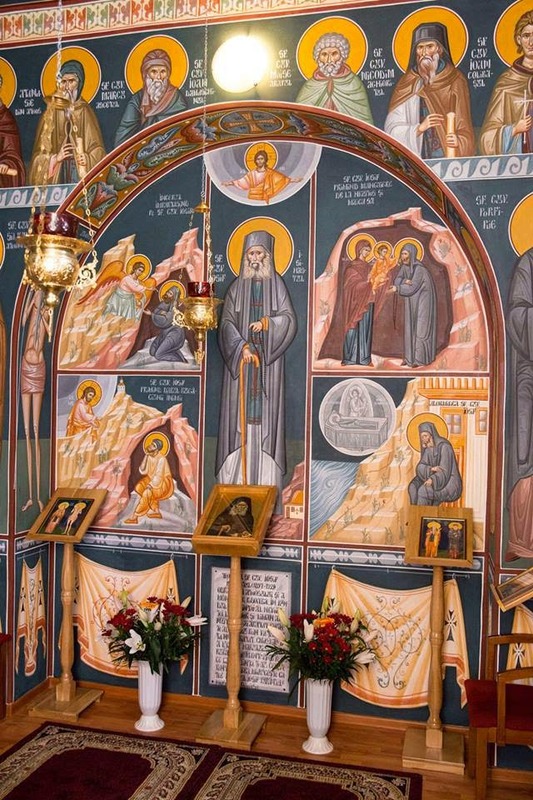 Upon their arrival they first informed the Ostrog monks of the Abbot’s dream and then look upon themselves a strict fast, all the while serving the complete cycle of daily prayers with Holy Liturgy. They did so for seven days. On the seventh day, they censed the Saint’s grave and opened it. Before them appeared the Saint in a glorified body the colour of pure wax, giving out the fragrance similar to that of basil leaves. 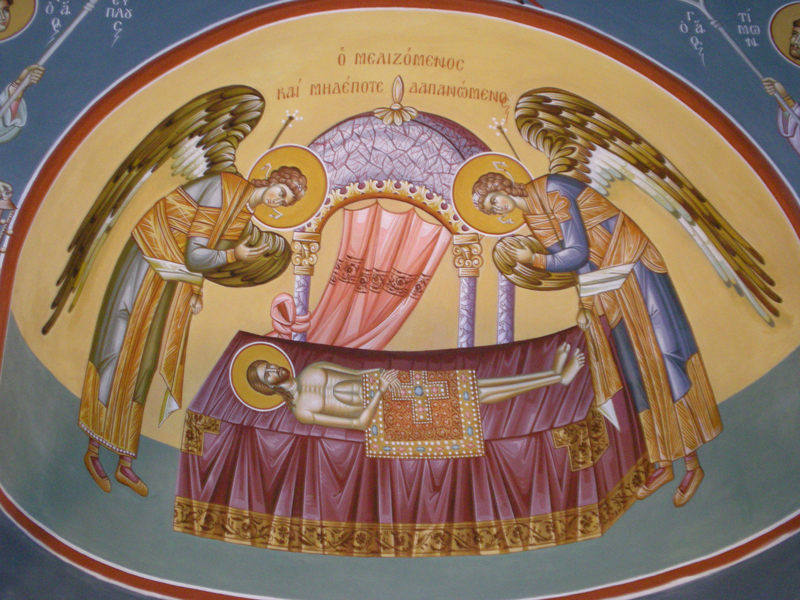 Then the monks placed his incorrupt body in a case and took it to the Upper Monastery, to the church of the Presentation of the Most Holy Theotokos, where it rests to this day. News of the glorification of St.Basil’s body quickly spread and people began to flock in great numbers to venerate his holy and wonderworking Relics. Not only Orthodox Christians, but also Roman Catholics and Lutherans, and even Muslims came to seek help at the great Sanctuary of Ostrog. According to their faith in the mercy of God and that of St.Basil they received help and found consolation. Even today pilgrims from all parts of the country, of all nationalities and religions come before the Wonderworker of Ostrog. Many people travel to Ostrog from abroad. From the holy reliquary arise prayers in many languages. Many parents bring their children to be baptised before the relics of St.Basil and many name their offspring after the Saint. 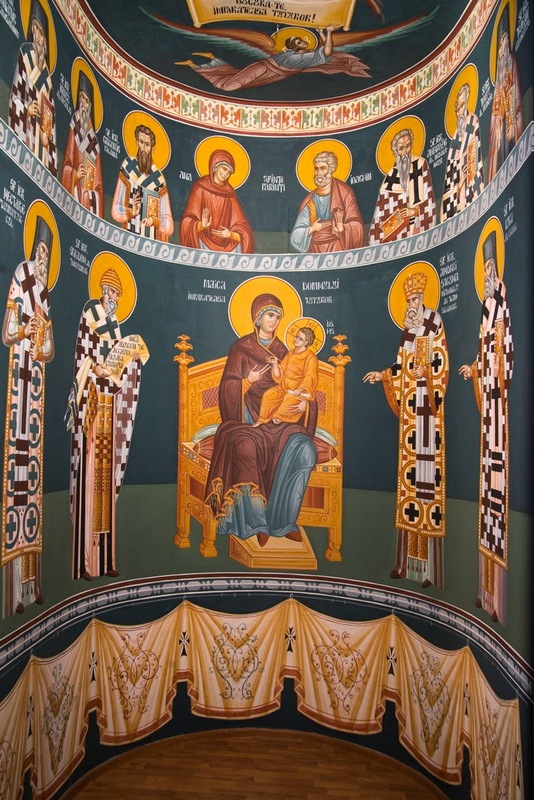 Many a marriage ceremony has been performed at Ostrog, countless confessions have been made and many people have partaken of the Holy Mysteries before the Holy Relics, while countless others have asked for prayers to be read for their health and salvation. Many sacrifices and donations are brought to the Holy Father at the Ostrog monastery, but the greatest sacrifice of all is that of sincere repentance and the will to cleanse one’s heart before God and Saint Basil. Even the godless and atheists respect and honour St.Basil and utter his name with fear. For, as everyone knows, one did not make light of St.Basil while he lived, and one certainly does not make light of him now when he is glorified. During his earthly life the Saint was never left in peace but was persecuted by many enemies of God and by the chief enemy of our salvation. After his repose his holy Relics were not spared by the evil one, either. The first time that the Ostrog monks had to conceal the Relics of St.Basil was in 1714., when Numan-pasha Chuprilich attacked and devastated Montenegro. The monks buried the relics below the monastery, near the Zeta river. The river overflowed and flooded the area where the relics were buried, but miraculously the water penetrated neither the reliquary, nor the relics of the Saint. The second time the relics had to be hidden was during the siege of Ostrog in the winter of 1852. The Turkish commander Omar Pasha encircled the monastery and the siege lasted for nine days. Thirty Montenegrins, headed by the great vojvoda (duke) Mirko Petrovic, father of prince Nikola, courageously defended the monastery. 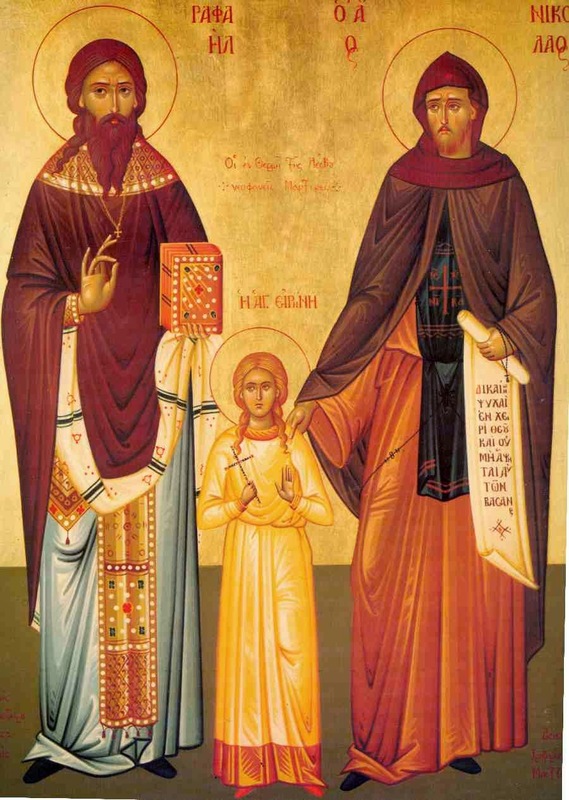 When they succeeded, with the help of St.Basil, in driving away the Turks, they served a thanksgiving molieban to God, the Most Holy Theotokos and St.Basil in the little church of the Presentation. 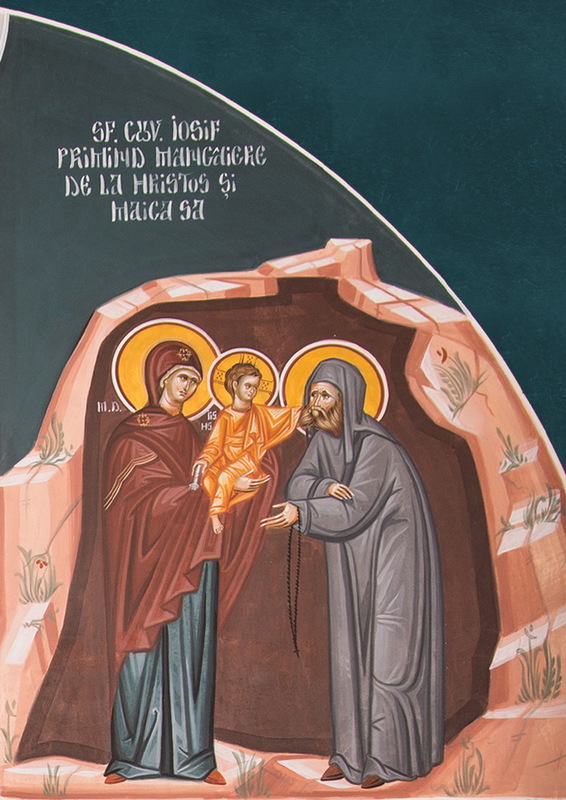 After that the Montenegrins took the Saint with them to Cetinje and placed him in the Church of the Nativity of the Holy Virgin, near the Relics of St.Petar of Cetinje. There they remained until the spring of 1853, when they were again returned to Ostrog. During the war with the Turks the monastery of Ostrog was burned and looted. Many Ostrog treasures, as well as documents dating from the time of St.Basil, disappeared forever. The third time the relics of the Saint were transferred was during the war in 1876-1877. They were again taken to Cetinje, where they remained for about a year. They were brought back to Ostrog in a majestic procession in 1878. See the source site for numerous miracles of St. Basil of Ostrog, taken from the excellent book: Healings of Soul and Body, St. Basil of Ostrog, translated by Ana Smiljanic, published by Svetigora in 2003, filled with over 300 pages of astonishing miracles of the Saint. 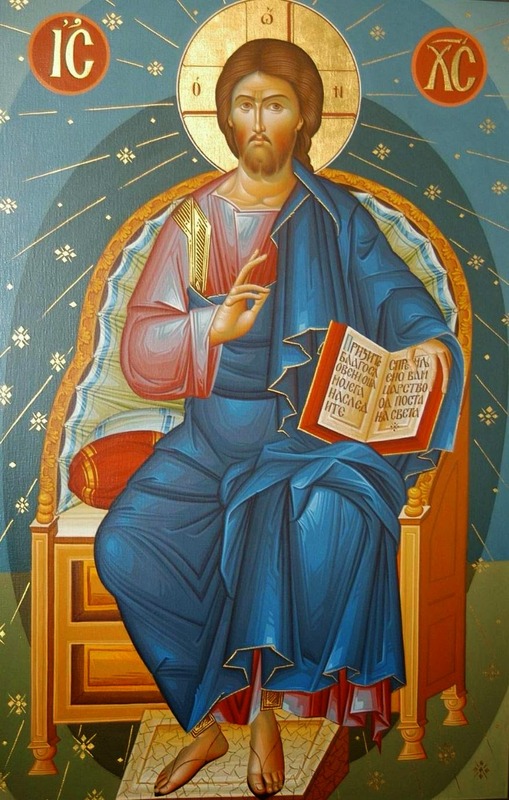 From your youth you gave yourself entirely to the Lord, remaining in prayer, labor and fasting, O God-bearing Father. Because you were an example of virtues and good works to your flock, seeing your good work, God established you as a pastor and good hierarch of His Church. And after your repose, He kept your body incorrupt, O Holy Basil. Therefore, with boldness pray to Christ God to save our souls. Even as a youth, you served the Lord, O Wise one, belaboring your body with prayer and vigil. Because you were shown to be a precious vessel of the Holy Spirit, He established you as a pastor of His Church which you tended well. And as such, you departed to the Lord whom you loved. We pray to you to remember us who keep your memory with faith, that all may shout unto you: Rejoice, O most honorable Basil. St. George Orthodox Cathedral in Covasna Romania, has dedicated one of its chapels to Panagia Pantanassa, the wondrous icon of the Theotokos from Vatopedi Monastery, through which many healings have occurred especially of cancer. This church is also blessed to treasure among its holy relics, those of Blessed Elder Joseph the Hesychast (+1959) (see the link for the life of the Elder). As such, this chapel is adorned with beautiful icons from the life of Elder Joseph. Elder Joseph was truly a spiritual giant of the 20th century, and continues to help thousands throughout the world through his example, his writings, and his prayers to the Lord. We pray that we all might have his blessing, and that we might soon celebrate his canonization by the Ecumenical Patriarchate. 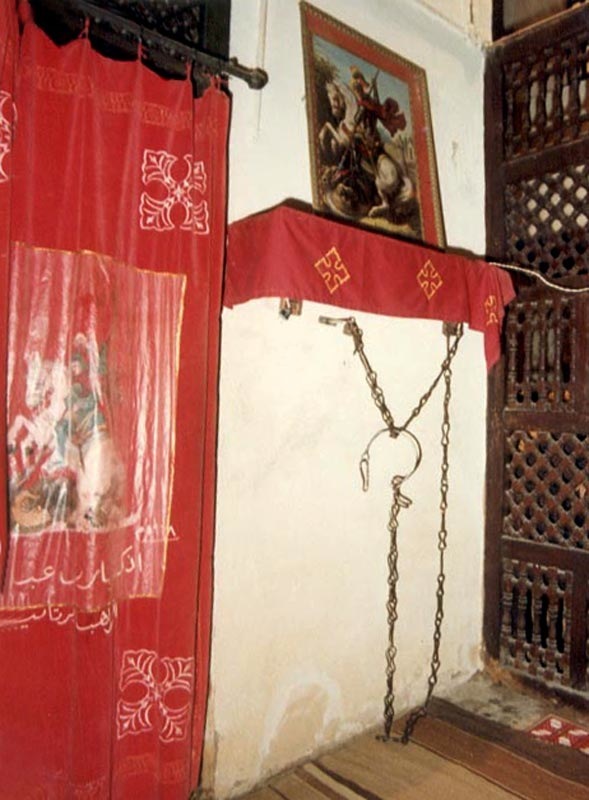 Pilgrims to the Greek Orthodox Church of St. George (seat of the Patriarch of Alexandria) can have the opportunity to visit the purported prison where St. George the Trophy-bearer was held by the Emperor Diocletian, the chains that bound him, and some of the instruments of torture, including the wheel that he was tied to, but soon freed from by an Angel. 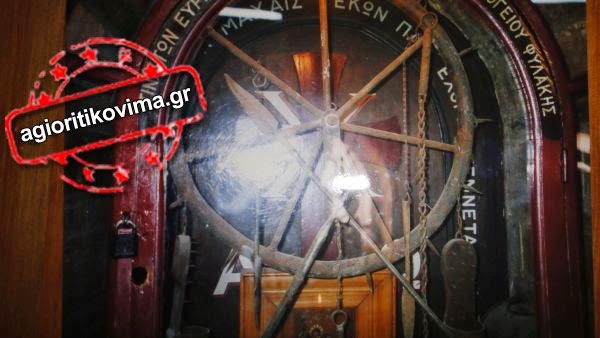 Below are photos from the Greek site Agioritikovima and also from Mystagogy (see the respective links for more info). I post this not at all to emphasize anything masochistic or macabre. The great sufferings of the Martyrs of Christ reveal their great love for Christ, the Way, the Truth and the Life, and from their great love for Him, they would sacrifice anything and endure everything. This is especially poignant, as there are Christians still today who are giving their lives for Christ throughout the world. May the example of the Martyrs inspire us all, whether in a small or great way, to sacrifice and live lives pleasing to Christ, Who suffered for us all and rose from the dead. To Him be glory and dominion unto the ages. Amen. Christ is risen from the dead, by death, trampling down upon death, and to those in the tombs, He has granted life! Truly the Lord is risen! The Jesus Prayer is a work common to the angels and to men. With this prayer, men quickly approach the life of the Angels. The Prayer is the source of all good deeds and virtues, and drives far away from man the dark passions. In a short time, it makes man worthy to obtain the grace of the Holy Spirit. Obtain it, and before you die, you will obtain an angelic soul. The Prayer is divine rejoicing. There is no other spiritual weapon that can so efficiently hinder the demons. It burns them like fire burns the brush. 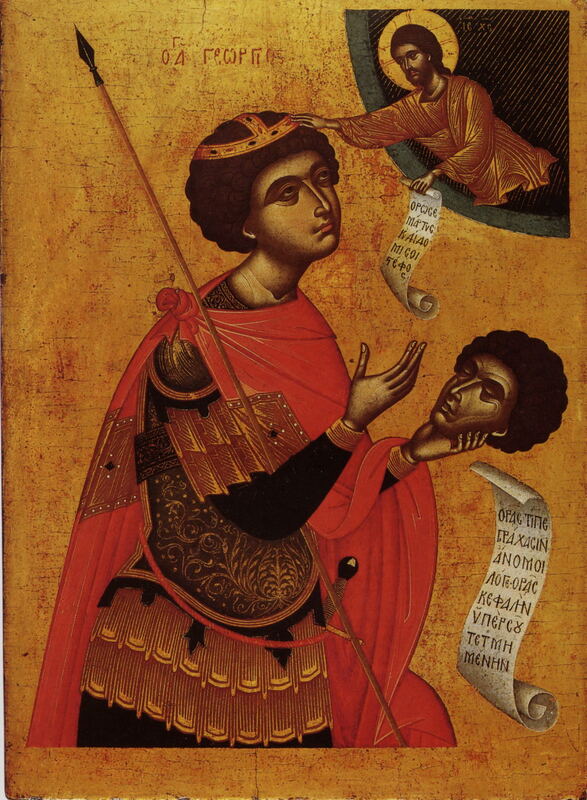 Today is the feast of one of the greatest martyrs of our faith, of St. George the Trophy-bearer. This feast coincides with the most beautiful season. And, as our church chants today, let us run to the fields to pick flowers and weave wreaths to crown the hero of our Christian faith. But to pick flowers is the easiest thing. We must do something else today, something higher and greater. What is this? We must get to know who this St. George was. And through this, I will try to give you a short answer. The homeland of St. George was Asia Minor. He was born in the area of Caesarea, and was a compatriot with St. Basil the Great. His parents were rich and noble. His father was martyred for Christ while St. George was still small in his cradle. His mother, who was only 20 years old then, was one of those mothers who believed in God. Because of this, she did not enter into a second marriage, like many do today, whose husbands have not even decomposed yet in the grave, when they are looking for a new man. No! In Asia Minor, there was one marriage, one and only. Like the birds, where if you kill one of a pair of mates, the other remains until the end crying in its cage. The same as then. I don't say that those who enter a second marriage sin, but that the primary marriage is the one which is blessed by God, the Holy Trinity, the All-Holy Spirit. Therefore, his mother remained a widow. Are you listening you women, are you listening you men? These feasts did not occur so that we can eat and have a good time. They occurred so that we might live like the Saints. Then St. George blesses us and is with us. The young widow had George when she was young. And together with her milk, she raised him and formed him. Blessed therefore is the mother. Behind every Saint is a mother. And behind St. George is a mother, who took him to her chest, and together with her milk, nursed him on the faith, the faith in Christ. George, the only son of the widow of the martyr, grew and discerned his inclinations. Early, he decided to enlist and become a soldier. He joined the military, therefore. He was distinguished as a soldier and as a general. He was first in battles. He had the heart of a lion. Thus he reached the rank of soldier, and even higher, of commander. But St. George, beyond military metals, had God. Because above everything else is God. Later, everything else comes as well. And if the faith in God is endangered, we must be ready to sacrifice metals and ranks and positions and staffs and miters and everything. A thousand times a monk on the Holy Mountain would die rather than betray Orthodoxy. A thousand times an honored soldier [would die] rather than a soldier who does not believe. A thousand times a villager who has God inside of him [would die], instead of an atheist scientist. A thousand times a worker or farmer that had God inside of him, instead of the riches of the world. This is our holy faith. Our Church does not come from the great and strong of the day, it is founded on the faith of the humble and down-trodden. The hour of St. George's trial came. It was the time of the final persecution of the first centuries. On the throne of Rome was one of the wildest beasts, the Emperor Diocletian (284-304). He had wild hate against the Christians. Because of this he ordered that whoever was a Christian, should loose their rank, and if they remained in the faith, they would be put to death. Diocletian ordered him to be seized. They took removed his metals, they took his weapons, and they threw him bound into prison. From the heights to the depths! But he had joy and exaltation. After these, outside of Caesarea, there was a temple of idols full of statues. They seized St. George therefore, and took him there, that he might sacrifice. He appeared with the face of an angel. He looked at the idols, and said with a loud voice: "In the name of Jesus the Nazarene, I ask you, O statues and idols, what are you?" And they responded: "We are not gods, but demons!" Then the Saint prayed, and immediately an earthquake struck the temple, and the statues fell and broke into pieces and dust. And only this? And the other miracle of St. George is wondrous. Outside of Caesarea, in a ravine, there was a spring of beautiful water, but no one dared to approach it, because near there was a great dragon, a gigantic serpent, which would come out and eat men and beasts. St. George approached the spring with his spear. The beast growled, exited with speed and opened its huge mouth to swallow him. But St. George--let the faithless disbelieve, we believe--what did he do? He pierced it within its bowels and the beast was torn apart and died. 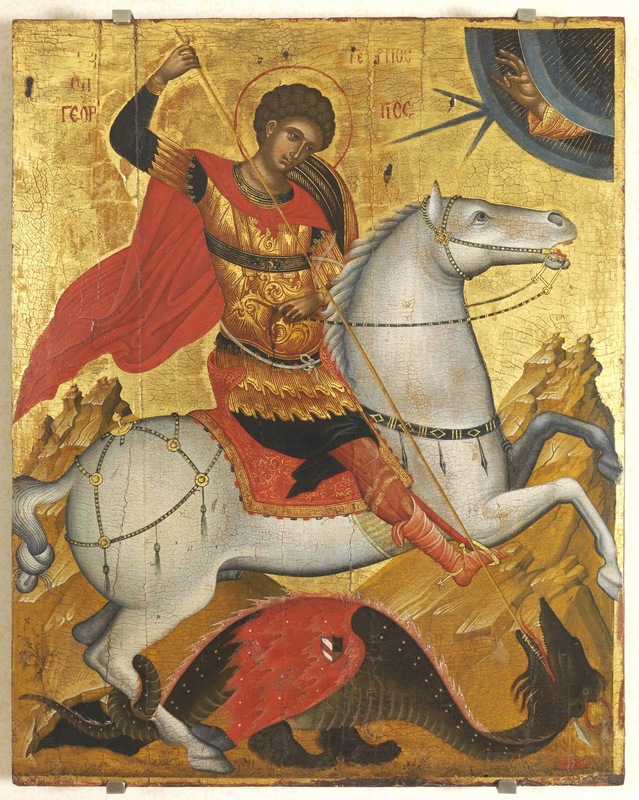 Because of this, you see St. George in icons depicted on horseback with his spear, which on its tip has the Cross of the Lord, in order to kill the dragon. These things seem unbelievable today. People of the world perceive these as myths. But we know that St. George did not only this, but things thousands of times higher occur. History is full of miracles worked by the Saints of our Faith, with the power of Christ. We have a living faith, totally alive, and we must love it and devote ourselves wholly to it. This is, therefore, my beloved, the life of the Saint in short. Because of this, St. George is one of the most beloved Saints. One more thing I want to tell you, and I'll stop. We saw the fearsome dragon which was at the spring, and did not allow anyone to refresh themselves. But besides that dragon, which St. George killed with his spear and with the Cross, in our days first and foremost, another dragon appears much worse than that dragon which St. George killed. And that worse dragon, which chokes all of mankind and endangers with the greatest destruction, is atheism, God-less materialism. With this dragon, our small country must struggle heroically, to not fall into its mouth. Because of this, even though others might betray their faith and their ideals, you poor children, the heroic children of the Church and the fatherland, remain faithful to God, and struggle with bravery, chest to chest, for everything that is most-holy of our land. With the help of St. George, we will go forward, we will overcome the obstacles. I pray that you remain fixed and immovable in the faith, through the intercessions of St. George, and all the Saints. Amen. 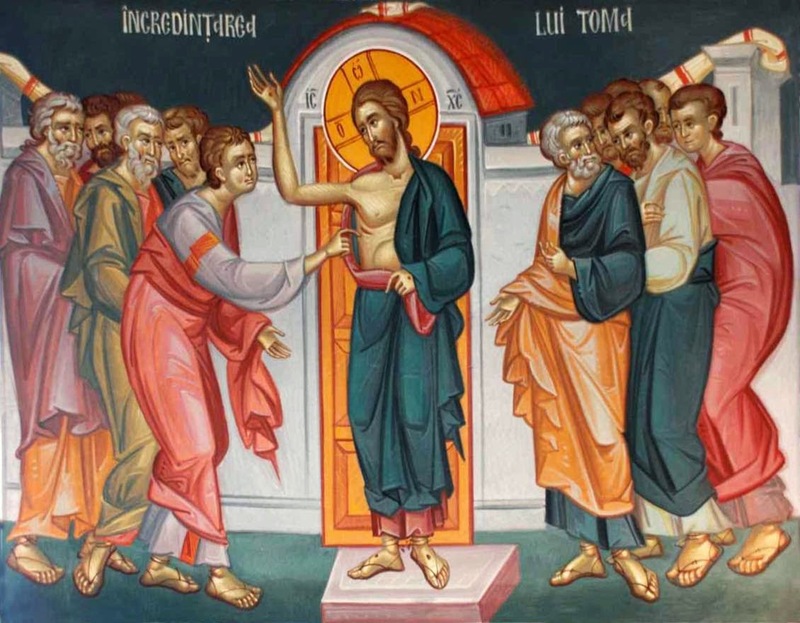 "The Lord appeared this second time for Thomas' sake - for the sake of one man, one sinner. He who is surrounded by the angelic choirs that joyfully hail Him as Conqueror of death, leaves His heavenly flock and hastens to save one wandering sheep. Let all those who, coming to great glory and power in this world, forget their weak and humble friends and, with shame and scorn, draw back from them, be ashamed at His example. In His love for mankind, the Lord turned from no sort of humiliation or effort. In His love for mankind, He - glorified and almighty - came down a second time into one simple room in Jerusalem. Oh, that blessed room, out of which there poured more blessings on the human race that there could ever be from all the palaces of emperors!" "The firmness of faith depends on God's grace. Who can comprehend the mysterious depths of God's providence? Who can say that God, in His providence, did not wish here to make use of Thomas' unbelief for the belief of many? In any case, two things have here been clearly shown: the terrible sickness of human nature, revealed in the stubborn unbelief of one of the apostles (who had innumerable reasons to believe), and God's most abundant wisdom and love. In His purity and holiness, God does not use evil that good may come, nor make use of evil means to achieve good ends, but, in His wisdom and His love for mankind, He corrects our evil ways and turns them to good." -St. Nikolai Velimirovic, Homily: "The Gospel on the Apostle Thomas' Doubt and Faith"
I wanted to write to you of a miracle that St. Raphael worked for me. My name is Eleni X. from Alexandria, Hematheias. In November 2011, I learned from my gynecologist that I was pregnant with my second child. My doctor told me to return the next month, in other words, December to listen to the baby's heartbeat. The time passed, and the day came that we were to do the ultrasound to hear the baby's heartbeat. We went to the doctor, and he puts the ultrasound on, and looks here and there, and nothing. The sac was larger than last time, but it was empty. Nothing was there. My husband and I froze. We heard the doctor tell us that he couldn't hear the baby's heartbeat, and he couldn't see any embryo. He called us into his office, and told us that we had to proceed with induction, so that there would not remain any products of conception, because there was a danger of causing sepsis and death. It was Tuesday when all of this took place. We set up the appointment for Friday (three days later). Those days, we were very saddened. 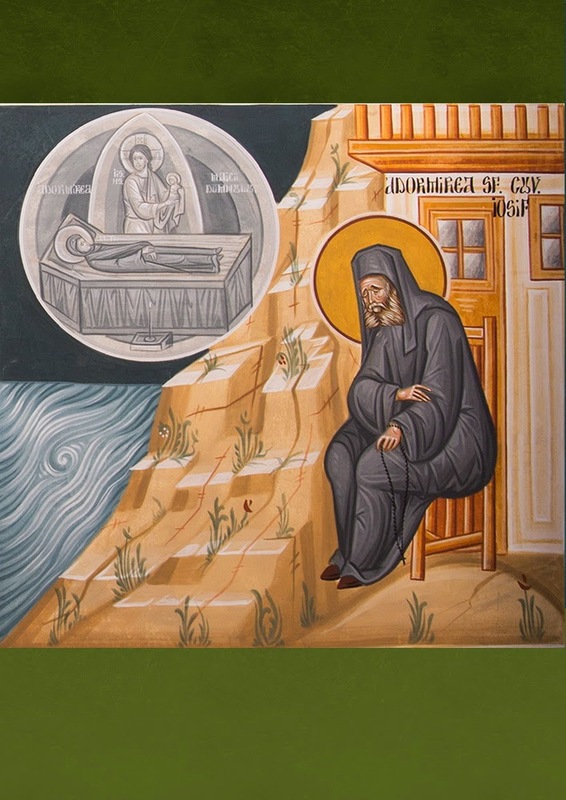 I therefore called one of the fathers of the Brotherhood of St. Raphael, Ano Souli, Marathon, whom I met over the telephone, and who supported me with his good words, and with his blessings and prayers. Full of pain, I related to him everything that took place, and I entreated him to pray for me and for my child. He gave me courage and strength. He said that I shouldn't loose hope, but that I should have faith in God and His Saints. He said that he would pray for me, but that I must pray as well, and entreat St. Raphael to take up the situation, and that I should say to St. Raphael: "O saint Raphael, go ahead in front of me, and I will follow you!" This I did. Friday came, and we went to the doctor to do the procedure. We reached the doctor's office. The doctor was in the operating room, because he had a delivery. As soon as he finished, I would go have the procedure. I waited a short time together with my husband and a friend of ours. The phone rang, and it was the doctor, who asked his employee if I had arrived yet, and told him that he was ready for the procedure. Then, the doctor said to wait because he wanted to see me first, because he wanted there to be no doubt [of no heartbeat] before the procedure. The doctor came down, and again put on the ultrasound. My husband was sure that there was no baby, and so he was waiting outside. The doctor put on the machine, and what did he see! My God, the little heart of the embryo was beating normally, and even I could see it!! The doctor lost it. He looked again 2-3 times. He went out perplexed to go look at his computer to see my history. (How could he know that St. Raphael's had his hand in the matter). After a short time, he entered again to the ultrasound, and called my husband and told us that the procedure couldn't take place, because there was a little baby, and its little heart was beating normally. My joy was so great that it couldn't be described with words. We were so happy. We left the doctor and our first thought was to go with our friend to light a candle to St. Raphael. We thanked St. Raphael from within our hearts for the miracle that he worked. He is my patron Saint, along with the Archangel Michael and our Panagia. He helps us daily with his presence. I will thank him my whole life! I thank you for everything, my Saint Raphael! Note: St. Raphael, other than being a protector of many sick people, is also a protector of pregnant women, as many women had experienced this, and he frequently appears himself in a dream, telling them to call upon him to protect them and those children that they are bearing, that they might be helped to have a good delivery. "At the Great Gates themselves, on the left side, stands a column made out of marble with a fissure from which the grace, that is, the Holy Fire, came forth. This column is honored by Orthodox as well as non-Orthodox, and even the Armenians. I would like to write a little about this incident, how the Orthodox Eastern Christians unanimously speak of it and the Turks themselves confirm it. In the wall there is an inscribed marble slab, and they say that this very incident is written on it; but we could not read it because it is written in Syrian letters, in the Arab tongue; and I only heard about it, but did not read it. 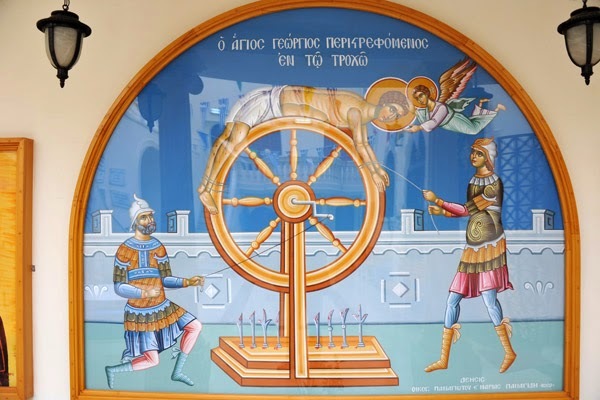 But the incident happened something like this: At one time when the Greeks were completely oppressed by the Turkish yoke, some rich Armenians took it into their heads to force the Greeks out of the Holy Sepulchre and out of the Church of the Resurrection. They gathered a large sum of money and bribed the Ottoman Porte and all the Jerusalem authorities, assuring the unbelievers that the Holy Fire comes forth not simply for the sake of the Greeks, but for all Christians, and "if we Armenians are there, we also will receive it!" And the Turks, who are greedy for money, accepted the bribe and therefore did as the Armenians wished, and they affirmed that only the Armenians would be allowed to receive the Holy Fire. The Armenians rejoiced greatly and wrote to all their lands and to their faithful, that more of them should go on a pilgrimage. And a great multitude of them did come. 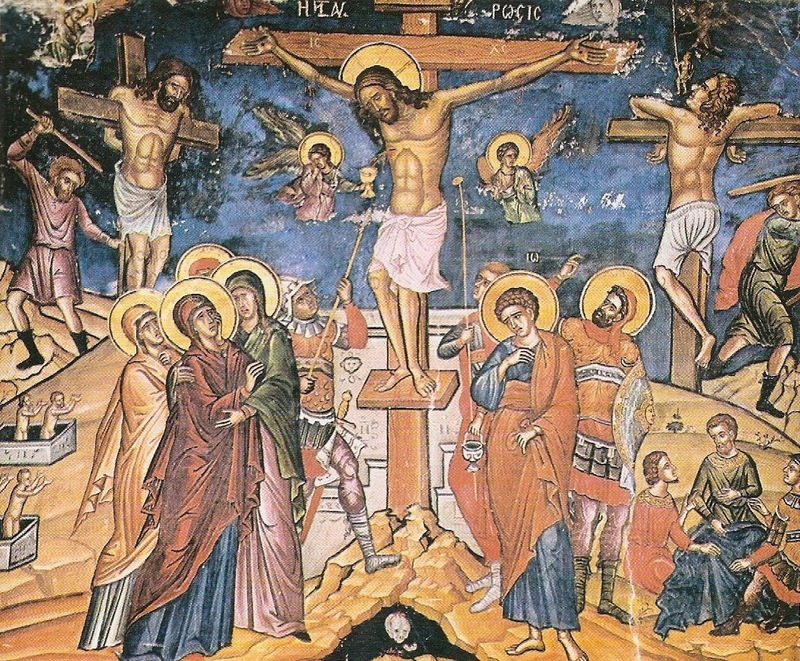 Holy Saturday approached: the Armenians all gathered in the church, and the Turkish army drove the poor Greeks out. Oh, what unspeakable grief and sorrow filled the Greeks! There was only one comfort for them -- the Grave of the Saviour, and they were being kept away from it, and the Holy Gates were locked to them! The Armenians were inside the church and the Orthodox were on the streets. The Armenians were rejoicing and the Greeks were weeping. The Armenians were celebrating and the Greeks were bitterly lamenting! The Orthodox stood opposite the Holy Gates on the court and around them stood the Turkish army, watching so that there would not be a fight. The Patriarch himself with all the rest stood there with candles, hoping that they would at least receive the Fire from the Armenians through the window. But the Lord wished to dispose things in a different way, and to manifest His true Faith with a fiery finger and comfort His true servants, the humble Greeks. The time had already come when the Holy Fire issues forth, but nothing happened. The Armenians were frightened and began to weep, and ask God that He send them the Fire; but the Lord did not hear them. Already a half hour had passed and more, and still no Holy Fire. The day was clear and beautiful; the Patriarch sat to the right side. All of a sudden there was a clap of thunder, and on the left side the middle marble column cracked and out of the fissure a flame of fire came forth. The Patriarch arose and lit his candles and all the Orthodox Christians lit theirs from his. Then all rejoiced, and the Orthodox Arabs from Jordan began to skip and cry out, "Thou art our one God, Jesus Christ; one is our True Faith, that of the Orthodox Christians!" And they began to run about all of Jerusalem and raise a din, and to shout all over the city. 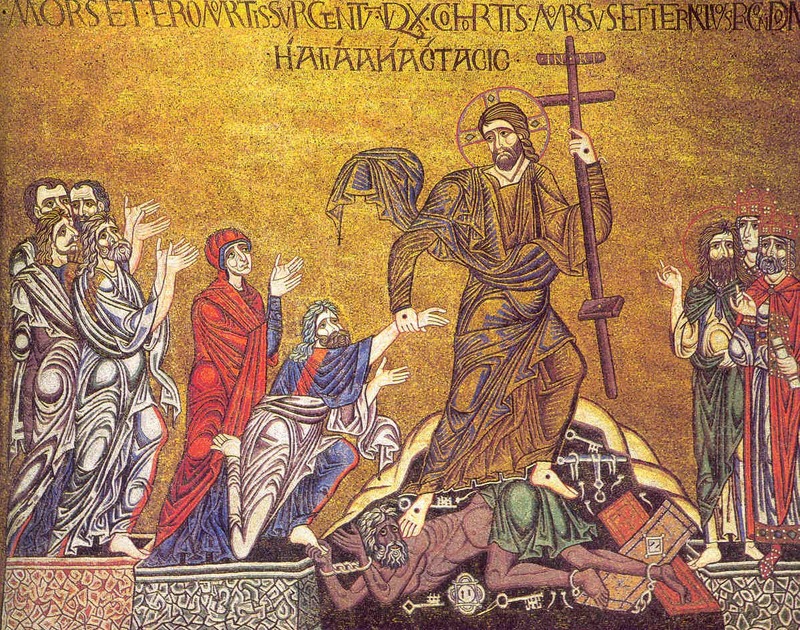 And to this day they still do this in memory of the incident and they jump and shout, running around the Holy Sepulchre, and they praise the one true God, Jesus Christ, and bless the Orthodox Faith. Beholding this wonder, the Turkish army, which was standing around on guard, was greatly amazed and terrified. 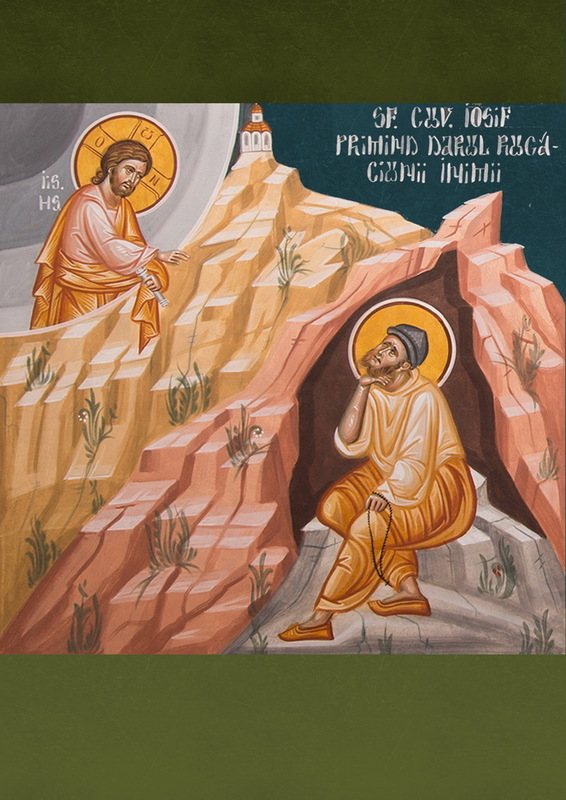 From amongst them one named Omir [other places written as Tounom the Emir], who was standing at the St. Abraham's Monastery on guard, immediately believed in Christ and shouted, "One is the true God, Jesus Christ; one is the true faith, that of the Orthodox Christians!" And he jumped down to the Christians from a height of more than 35 feet. His feet landed on the solid marble as if though on soft wax. And to this day one can see his footprints imprinted as though in wax, although the non-Orthodox tried to erase them. I saw them with my own eyes and felt them with my own hands. 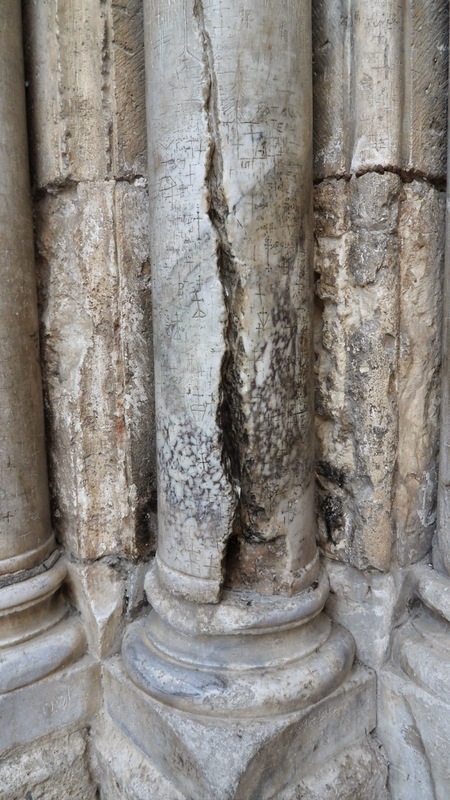 And the column with the fissure still bears the scorch marks. As for Omir the soldier, having jumped down, he took his weapon and thrust it into the stone as though into soft wax, and began to glorify Christ unceasingly. 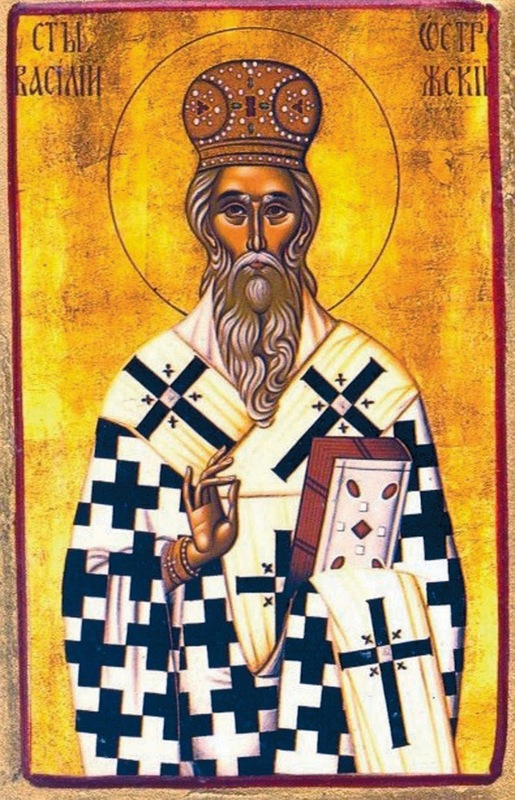 For this, the Turks beheaded him and burned his body; the Greeks gathered up his bones, put them into a case and took them to the Convent of the Great Panagia, where they gush forth fragrance until this day." Today, as a radiant lamp shining on the heavenly firmament, is the memory of Tounom, who was enlightened by God, and he was the deposer of error, mystically shining upon the hearts of the faithful. For he, having beheld the Holy Light mystically, saw it sent from God to the pillar in the courtyard of the Church of the Resurrection, and lighting the lamps of the Orthodox, who were locked out by the wrath of the Heterodox. This dissolved the darkness of faithlessness, and this made him a confessor, and a fervent preacher, and now he is an inheritor of the heavenly Kingdom, as a confessor and all-perfect Martyr, who ceaselessly intercedes to Christ that we be granted the good transformation before our end. He Who sent down from on high the Holy Light like a tongue of fire upon the Orthodox Patriarch alone, and consumed and rent the pillar of the courtyard of the All-sacred Church of the Resurrection, filled you with wonder, and changed you towards the good, O Martyr Tounom, therefore you were born again as not only a confessor, but also a Martyr of piety. You became an inheritor of the good things prepared as reward for the world, and you beheld the Lord, the Giver-of-Light. Do not cease to intercede that He might dissolve the darkness of soul-destroying ignorance and the trials of life. 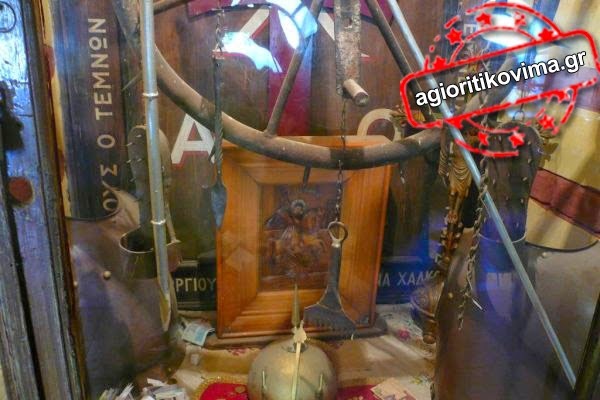 Apolytikion in the Plagal of the First Tone. Like the Thief who cried, "Remember me", O Christ, at the eleventh hour, and proceeded to faith in Christ, Tounom the Emir steadfastly suffered with holiness at the hour of the receiving of the Holy Light by the Orthodox. Let us honor him with hymns. Let us hymn him who beheld the Holy Light as fire descending strangely upon the Orthodox, in the pillar of the courtyard of the Church of the Resurrection, and was changed for the good, and became a preacher of Christ and a Martyr at the eleventh hour. Let us cry out with fervor: Rejoice, O blessed Tounom. Rejoice, energy of noble Martyrs. Rejoice, holy impress of struggle. Rejoice, for you drove out the error of the sons of Hagar. Rejoice, you who struggled perfectly as in the stadium. Rejoice, the boast of Martyrs of the faith. Rejoice, you who took up Christ's calling. 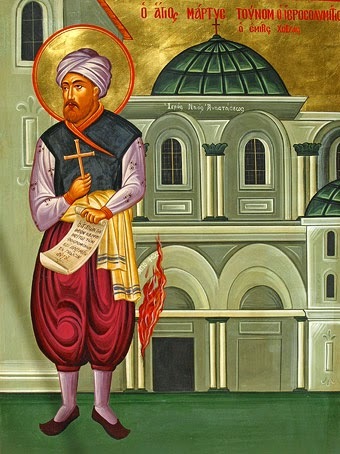 On the 18th of this Month (or Bright Tuesday), the Holy New Martyr Tounom the Emir, who believed through the miracle of the Holy Light in the year 1579, and was perfected with in fire. Leading you towards Christ, the Light of the world. Let us praise the Martyr of Jerusalem, who came forth as a rose from among thorns, pouring forth fragrance through his martyrical confession for the world. Let us cry out: O Tounom who was glorified by God, who received the crown of the eleventh hour from the hands of the Lord, Who grants the rewards to the last as to the first, and made you worthy to partake of the Tree of Life in the heavenly pasture. Do not cease to intercede on behalf of those who honor your memory. Rejoice, O you who confessed the name of Christ, having seen the divine Light, O martyr Tounom, the lamp of the Orthodox, and lamp-lighter of the Martyrs, who received a crown. "And on Great Saturday (likely 1924), the [Uncreated] Light visited me after Holy Communion, and I sensed it as a touch of divine eternity with my spirit. Gladsome, full of peace and love, the Light remained with me for three days. It dissolved the darkness of nothingness, which stood before me. "I was resurrected, and within me, together with me, the whole world was resurrected. 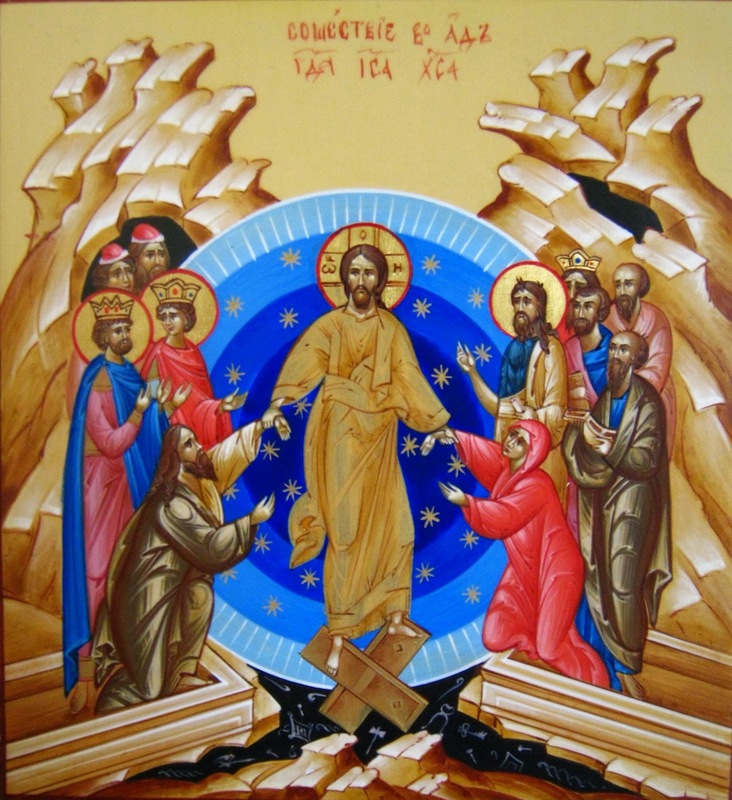 The words of St. John Chrysostom at the end of the service of Pascha I heard with astonishing power: 'Christ is risen, and there is not one dead left in the tomb.' Depressed by the sight of general death, at that instant I experienced: In reality, my soul was resurrected, and I don't see any dead men anymore...If God is like this, I must soon abandon everything and seek only union with Him." "The descent of this (Light) to us is nothing other than the revelation of God to man: the revelation of heavenly mysteries. Without this light, the earth would remain without true knowledge of God. Based on my personal experience, I returned to myself to name that Light the Light of the Resurrection. With the coming of that Light, the spirit of man comes to the plane where there is no death. The radiance from this Light grants man the experience of the Resurrection as a foretaste of the blessedness to come." "Christ, after His Resurrection, appeared exclusively to those who were able to understand His already deified and enlightened flesh, which remained invisible to others." "Without faith, however, (in the Resurrection) every trial becomes absurd: void of meaning...We struggle for the Resurrection, both of the individual and of every other fellow man." The Resurrection of Christ is the "greatest event of the created world." So for the future it shall be the rule for me to speak to you in this way. For the words which are spoken directly to sluggish souls awaken them more readily than a sermon that is read to them; moving them by that touch as it were of authority, so that they listen with more attention. I am not, as I well know, competent to fulfill this office: but let your charity make good what my ignorance denies me. For I have in mind Him Who has said: Open thy mouth wide, and I will fill it (Ps. lxxx. ii). We all have in mind a good work , and it will be perfected by His divine assistance (II Tim. iii. 17). 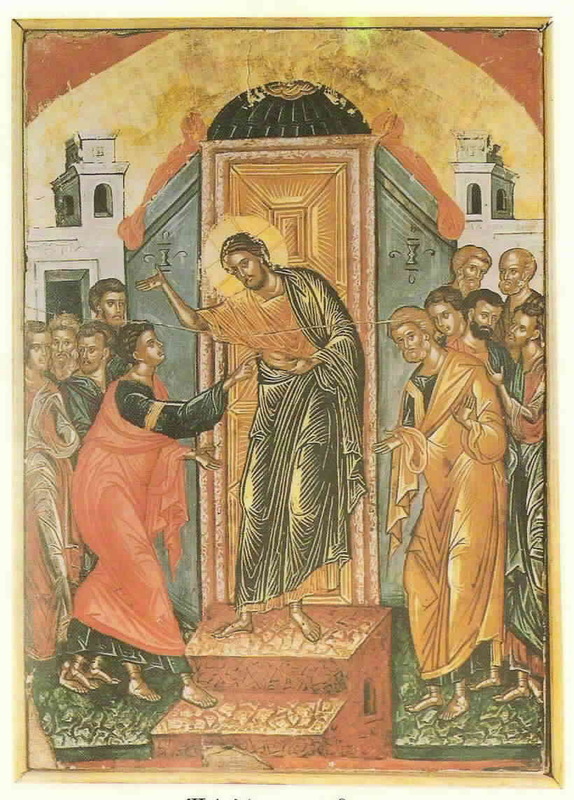 And also, this great solemnity of the Sunday of the Resurrection gives us a fitting occasion for speaking to you: for it would indeed be unfitting that the tongue of our body should be silent in the praises that are clue this day; that day on which the Body of our Author rose again from the dead. 2. You have heard, Beloved, how the holy women who had followed the Lord came to His tomb, bringing with them sweet spices, so that with tender affection they might tend Him in death Whom they had loved in life. And this tells us something which we should observe in the life of our holy Church. And it is important we give attention to what here took place: to see what we mint do to imitate them. And we also, who believe in Him Who died, truly come with sweet spices to His tomb, when we come seeking the Lord, bringing with us the sweet odour of virtue, and the credit of good works. And so, since Our Redeemer has now passed over beyond the mortality of this present life, tightly does the Angel, who had come to announce His entry into eternal life, sit at the right side . And he came clothed in white: for he was announcing the joy of this our present solemnity. For the whiteness of his garments signifies the glory of our great Feast. Should we say ours 0t His? That we may speak truly let us say that it is both ours and His. For this day of our Redeemer’s Resurrection is also our day of great joy; for it has restored m to immortality. It is also a day of joy for the angels: for restoring us to heaven, it has filled up again the number of its citizens. On this our festival day, and His, an angel appeared, clothed in white robes, because they are rejoicing that because we are restored to heaven the losses their heavenly home had suffered are now made good. 4. Now let us hear what the angel says. You seek Jesus of Nazareth . Jesus, in the Latin tongue, is saving ; that is, Saviour . Then however many were called Jesus, by name, not because of the reality it means. So the place is added, to make clear of what Jesus he is speaking: Of Nazareth . And to this he adds the reason they seek Him: Who was crucified . And then he goes on: He is risen, he is not here . That He was not there was said only of His Bodily Presence; for nowhere is He absent in the power of His divinity. But go , he continues, tell his disciples and Peter, that he goeth before you into Galilee . 5. And well did he say of Our Redeemer that: He goeth before you into Galilee; there you shall see him, as he told you . For Galilee means, passing-over . And now our Redeemer has passed over from His suffering to His Resurrection, from death to life, from punishment to glory, from mortality to immortality. And, after His Resurrection, His Disciples first see Him in Galilee; as afterwards, filled with joy, we also shall see the glory of the Resurrection, if we now pass over from the ways of sin to the heights of holy living. 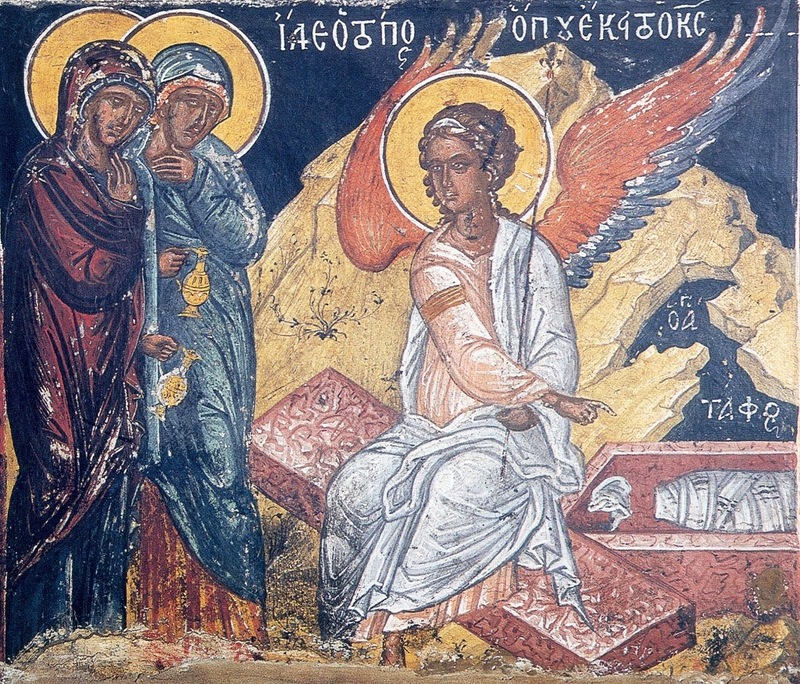 He therefore Who is announced to us from the tomb is shown to us by crossing over: for He Whom we acknowledge in the denial of our flesh is seen in the passing over of our soul. Because of the solemnity of the day, we have gone briefly over these points in our explanation of the Gospel. Let us now speak in more detail of this same solemnity. 7. And here there comes to mind what the Jews, insulting the Crucified Son of God, cried out: If he be the king of Israel, let him come down from the cross, and we will believe him . Had He, yielding to their insults, then come down from the Cross, He would not have proved to us the power of patience. He waited for the little time left, He bore with their insults, He submitted to their mockery, He continued patient, and evoked our admiration; and He Who refused to descend from the Cross, rose again from the sepulchre. More did it matter so to rise from the sepulchre than to descend from the Cross. A far greater thing was it to overcome death by rising from the sepulchre, than to preserve life by descending from the Cross. "Let all mortal flesh keep silent..."
Let all mortal flesh keep silent and in fear and trembling stand, pondering nothing earthly-minded. For the King of Kings and the Lord of Lords comes to be slain, to give himself as food to the faithful. Before him go the ranks of angels: all the principalities and powers, the many-eyed cherubim and the six-winged seraphim, covering their faces, singing the hymn: Alleluia! Alleluia! Alleluia! ***Note: This ancient hymn is also chanted during the Divine Liturgy of St. James, and during the Divine Liturgy at the Consecration of a Church. However, it is perfectly suited to be chanted on Great and Holy Saturday (see here for more info). It is Holy Friday today, my beloved and brethren fellow-sinners, a holy day full of memories, a day which calls forth strong emotions and tears. Let us, at this hour, cleanse our heart and mind of every worldly idea, every evil thought and idea, let us cleanse our mind, and with the wings of imagination let us go back centuries, and let us noetically visit the Holy Lands. One can go there, but not be there, while one might not travel bodily to the Holy Lands, but be there spiritually. Therefore, let us go with our thought to that place which is called the place of the Skull, called Golgotha. There is playing out the drama of dramas, where the great battle was waged between the light and the darkness, truth and falsehood. There on Golgotha, the Redeemer of the world is now being crucified. Many behold His sacrifice from heaven, the ranks of the holy Angels and Archangels, the Cherubim and Seraphim, who from the theoria of eternity behold the drama, and were ready with their flaming swords to slaughter the executioners. From the earth, that mass beheld Him, the people who four days before, on Palm Sunday, cried out: “Hosanna” (Matthew 21:9, Mark 11:9-10, John 12,13) and now they are below the Cross mocking Him. Beholding Him also are the idolatrous soldiers, the regiment which was headed by the Centurion, who received the command to ascend the place of the Skull to fulfill the judgment of the Judean court. These wild Romans, who had fought battles and were used to human blood being shed, remained unmoved, or more properly, not unmoved, but continuing the mocking which thy began in the Praetorium of Pilate. Following the events, they were casting lots below the Cross and drinking...But straightaway the middle one among those three being crucified, Jesus of Nazareth, caught their attention. They saw that He was different from the others. They were blaspheming, condemning the day that they were born, throwing out sharp insults against everyone, while the Crucified One was silent. His silent is mysterious, a silence which is moving. Christ is silent. And when He opens His spotless mouth to say the seven words of the Cross, His words are not condemnation, but blessings, words which made a deep impression on everyone who heard and saw Him. These words were noted by those who crucified our Christ. The soldiers heard Him say: “Father forgive them, for they know not what they do” (Luke 23:34), they heard “I thirst” (John 19:28), they heard: “Eli, Eli, lama sabacthani?” (“My God, my God, why have you forsaken me?”) (Matthew 27:46, Mark 15:34), they heard: “It is finished” (John 19:30). All of these they heard and they thought: “Who is this, who appears totally different than the other convicts...” And when at noon they saw the sun turn dark, and darkness cover all of creation, and the earth quake, and the graves open, then they believed. There remained not a single hesitation or doubt, and together with the Centurion they said in fear: “Truly, this was the Son of God” (Matthew 27:54). This was truly not by chance, but He has a supernatural origin, He is the Son of God, the true God. From the time that the Centurion said those words, about twenty centuries have passed. And this witness and confession does not remain alone. It is continued until today. Many, countless witnesses say that Christ is God, the God-man. Do we have examples? We have. What are they? Let me offer a few. “Truly this was the Son of God.” First, His teaching cries out. Open the books of all the religions, read all the books of the philosophers, hear the words of the greatest rhetors. You will see that the teaching of Christ surpasses, is incredible. I don't doubt that the others said important things, but their words resemble small flecks of gold mixed into a ball of various metals. They resemble a small light, like the light of a candle, before the sun. The words of Christ are light and life, and always made a great impression. Even His enemies who heard Him were compelled to confess: “No man ever spoke like this man” (John 7:46). "Let the human spirit goes forth", as someone said, "let science progress, let discoveries occur, for humanity will never reach the height of the teaching of Jesus Christ". And someone else said: "I don't know if there are other rational beings on other planets, but even if we hypothesize that they exist and dwell there, they could not possibly have a higher religion that that which was preached by Christ". “Truly, this was the Son of God.” His teaching cries out, and so do His wonders. The wonders of Christ! Wherever He stretched forth His hands, wherever His divine command was heard, there the wind stopped, the sea was calmed, the demons fled, the blind saw, the deaf heard, the dumb spoke, the lepers were cleansed, the paralytics stood up, and even the dead were raised from their graves. True wonders, not fantasies. Wonders which occurred not at night in some unseen corner, but before the eyes of the multitude, and sometimes even by the enemies, who saw these and said in astonishment: “We never saw anything else this before” (Mark 2:12). The wonders of Christ are countless. And even if the sea would become ink and heaven paper and the trees pens, it would not be enough to recount all of the wonders that our Lord Jesus Christ worked, that He works, and that He will work until the end of the ages. “Truly, this was the Son of God”. His spotless life further cries this out. Christ is holy, not in a relative sense like many men, but in the absolute sense. It is He Who never committed any wrong or vice, “there was no guile in His mouth” (Isaiah 53:9, I Peter 2:22), it is He Whose life was radiant from every angle, He Whose virtue “covered the heavens” (Amb. 3:33) Which virtue of Christ should we offer first? His poverty and simplicity, for no one else lived so humbly that He had not even “a place to lay His head” (Matthew 8:20)? His meekness and forbearance before His enemies and crucifiers? His boldness and lack of fear before rulers and Pilate when He proclaimed the truth? His humility, to the point that He bent to wash the feet of His disciples? Or before all, His love towards God and men who were suffering? All of these create the greatest icon of the life of Christ on earth. Some tried to find fault, they searched the Gospels, they scratched their heads, but they couldn't find any blemish. The sun even has its spots, but Christ is the Spotless Sun. It is He who said: “Who convicts me of sin?” (John 8:46), and the question remains unanswered throughout the centuries. “Truly, this was the Son of God”. This is shown by His teaching, His wonders, His holiness of life, and ultimately by the witness of the centuries. The Centurion was not alone in bearing witness to this. Generations of generations of Saints bear witness. Small children like St. Kerykos, who were held in the arms of their mothers, chaste virgins, simple workers like fishermen, wise scientists: all confessed that Christ is truly God. We also today, my beloved, behold the Passion of our Savior. How are we following this divine drama? Like the Angels, with love and worship, or like the multitude, who cried out “Hosanna”, and then “Crucify Him, crucify Him” (John 19:6)? Let us follow like the Centurion, who abandoned hesitation, and believed and confessed the Son of God. If there is any who have any doubt regarding the person of Christ, he only needs to approach, to test, to study with sincerity. And then, like the Centurion, he will be led by realities to confess also that Christ is “truly the Son of God”, that He is one of the three persons of the Holy Trinity, that He is the God-man and Redeemer. Him, O children of the Greeks, let us hymn and greatly praise, unto all the ages. Amen. Recorded homily which occurred in the Church of St. Panteleimon, Florina, on April 24th, 1981. "I gave my back to scourgings..."
"This is our God and there is none like Him"